Professor Davy McCracken said upland areas still face a lot of demands. The challenge for Scotland’s hill farming and conservation interests to speak with more of a “common voice” was one of the headline conclusions to emerge from the launch in Perthshire of a UK-wide series of hill and upland debates. Farming and conservation representatives, meeting at Lurgan Farm near Aberfeldy, kicked off the seven-event series with an assessment of what hill and upland farming is already delivering for the economy, environment and society, followed by a discussion of what policy and support changes may be needed to help both sides of the upland economy achieve its potential. 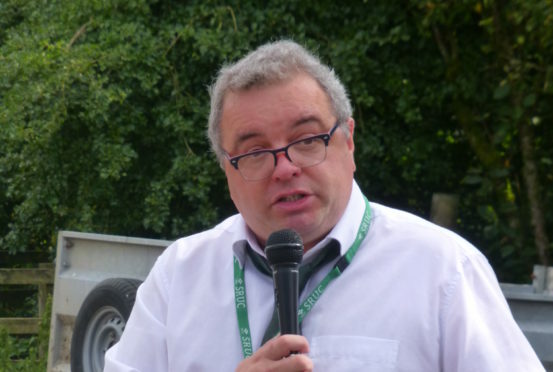 “There are an awful lot of demands being placed on hill and upland areas,” said Professor Davy McCracken, head of integrated land management at SRUC, who funded the Aberfeldy meeting. “Common asks range from producing food on a purely agricultural basis to meeting a wide spectrum of environmental requirements, such as restoring peatlands and planting trees. In that context, he said speaking with a common voice on how the hill and uplands should be managed, supported and developed, would be crucial to the future of such areas. “Whatever outcomes are eventually decided should be achieved by the hills and upland, whether environmental, hill farming or both, it’s clear that the management of this mix will be absolutely vital going forward,” he said. The Lurgan meeting also generated a lot of discussion and concern about the fact that upland and hill farming systems are already very fragile, with the prospect of becoming even more fragile in the future, depending what happens with Brexit. “If, for example, we lose a significant number of hill farmers and crofters in the months and years ahead, then we’ll lose the ability to have any influence on how these large areas of Scotland are farmed and managed,” said Prof McCracken. “Ironically, although the areas we’re talking about account for about 70% of our total land area, we don’t have any one body which speaks for both sides of the land use debate. The next stop in the series will be in the Lammermuirs on April 24, heading towards a final Scottish event held as part of the Cairngorms Nature: Big Weekend on May 10.